The fourth-generation Chevrolet Camaro is an automobile which was produced by Chevrolet for the 1993 through 2002 model years; though 30 the very last models were unofficially produced in 2003. It was introduced on an updated F-body platform. It would retain the same characteristic since the first-generation's introduction back in 1967; 2-doors, 2+2 seating, available as a coupe (with optional T-top roof) or convertible, rear-wheel drive, and a choice of pushrod V6 and V8 powerplants. The 1998 model year was refreshed and revised with both exterior and engine changes. The fourth-gen Camaro would last up through the 2002 model year when General Motors discontinued production due to slow sales, a deteriorated sports coupe market, and plant overcapacity. 1993 was the debut year for the fourth generation Camaro, and production continued until 2003. Production was moved from GM's Van Nuys, California assembly plant to Sainte-Thérèse, Quebec, Canada in 1993. The new design incorporated sheet moulding compound (SMC) made from chopped fiberglass and polyester resin for the roof, hatch, doors, and spoiler. Both the front and rear suspension design was improved. Base Camaros were powered by a 160 hp (119 kW) 3.4 L pushrod V6. 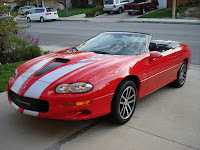 The Z28 versions featured the 350 LT1 V8 engine, also pushrod, with 275 hp (205 kW) and 325 lb·ft (441 N·m) torque that had been introduced in the Corvette one year earlier, as well as an optional Borg-Warner six-speed manual transmission when ordered with the V8. The Camaro was the first of many vehicles to use this gearbox. 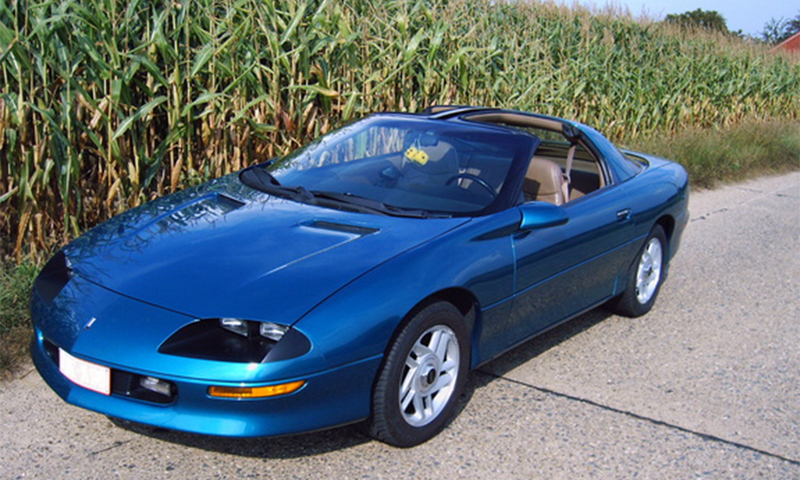 In 1993, the Camaro Z28 was selected as the official pace car for the Indianapolis 500. A "pace car edition" as a $995 option found 633 buyers and featured "Indy 500" identification on black and white body color scheme with multicolored pinstriping and white painted roadwheels. Several changes occurred for 1994. The 4L60 automatic transmission was replaced with the more dependable and better built 4L60E that included electronic controls, and was also used in Chevrolet trucks and Tahoe of this era. 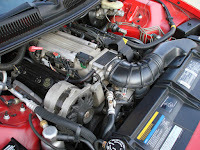 Accordingly, the car's on-board computer was modified from dealing only with the engine as in 1993 and earlier, to controlling both the engine and transmission on automatic models. The computer, in 1993, was run via Speed Density, which measured engine speed (RPM) and load (MAP in kPa) to compute airflow requirements and then use that against the VE table to get the proper fueling for conditions. An IAT (Intake Air Temperature sensor) was also used as air density changes with temperature. In 1994 however, the computer logic was changed over to a Mass Air Flow system. This system uses a Mass Air Flow Sensor placed in front of the throttle body to measure the incoming airflow into the motor. This is measured by using a heated wire in the sensor in the airstream path which has heat pulled away from it via the incoming air. This reduced heat is converted into a voltage signal which is sent to the PCM which then converts that voltage signal into mass flow. 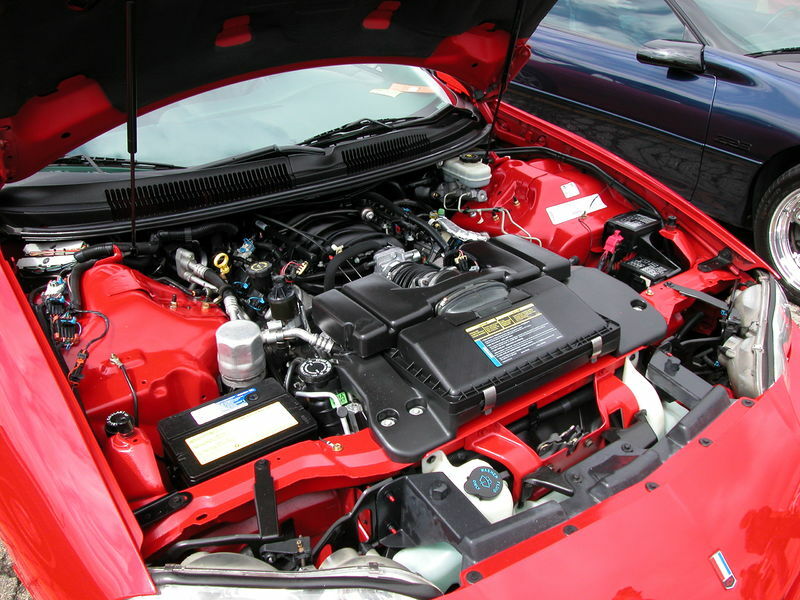 The computer uses engine sensors to judge engine conditions and provide the proper fueling off of this mass airflow reading. This was one of the main differences between the 93 and 94+ F-Body cars (and 92-93 Vette's compared to 94-96) and one of the items that makes a 93 model unique. Another prominent difference between the "Speed Density" 93's and the 94+ cars is how the programming (or custom tuning) of the computer takes place. In 1993, the stock computer uses a Memcal chip, which is a removable chip from the computer. Contained in this chip is the program for the car to run. In the 1994+ cars, this was swapped to a non-removable reflashable chip, which could be reprogrammed via the Assembly Line Diagnostic Link, or ALDL, located underneath the driver side of the dash, next to the center console. Many people view this as a more user-friendly and easier way to tune the vehicle. Dashboard gauge graphics were changed from yellow to white. There was also a spot in the gauge cluster that says ASR off. 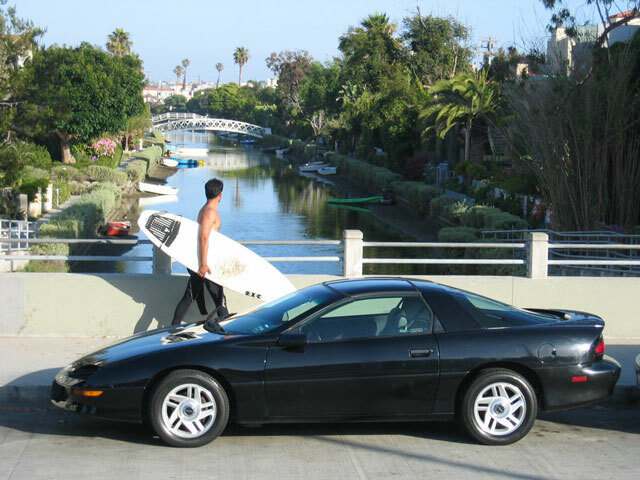 GM had every intent to put ASR or Acceleration Slip Regulation (Pontiac called it "TCS") in the 94 F-bodys, but it never made it into production until 95. The front brakes were revised on the Z28 model. Cooling fans were changed mid-year from a parallel to a series setup. On low both fans operated on 6V, but on high both operated on 12V. The V-8 LT1 equipped Camaro Z28s did 0-60 in 5.7 seconds and quarter mile times of 14.2. 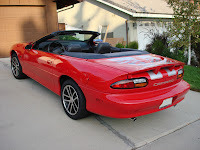 In 1995, base Camaros in California were equipped with a new 3800 Series II engine for emissions compliance while base Camaros sold elsewhere retained the 3.4 L (207 cu in) engine. This would be the last year the 3.4 L (207 cu in) V6 engine would be available. For the LT1-powered Camaros, the often-problematic Opti-spark distributor was updated to include a vent to remove moisture from the unit. The cam drive system for the distributor was also changed, making "early" & "late" model cams and distributors non-interchangeable. 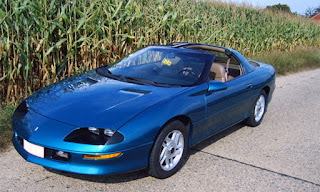 1995 was also the first year the fourth-generation Camaro had the option of painted side bars and mirrors. Traction control became available as an option on LT1 Camaros, but was installed on the base Camaros. Z28 rooftops, door handles, and mirrors, which were previously only available in black, now had the option to be painted the same as the body color. 1996 saw minor mechanical revisions, as well as small power gains from the new OBD II-compliant engine controls. All base model Camaros were now equipped with the 3800 series II rated at 200 bhp. V8 models still came with the 5.7 LT1 engine. The dual catalytic converters required by OBD-II resulted in lower restriction and a mild power boost to 285 hp (213 kW) and 325 lb·ft (441 N·m) of torque. Two option packages also returned: the RS (last seen in 1992), an appearance option for the V6 model, and the SS (last seen in 1972), a performance and appearance package for V8-powered cars. The SS cars were the highest factory performance Camaros offered at the time and included a functioning hood scoop and new five-spoke 17 in (43 cm) x 9 in (23 cm) wheels. The new wheel and tire package on the SS resulted in better handling and braking compared to the Z28. Convertible Super Sport cars however had 16 inch ZR1 style wheels. Also available this year for the V6 model was the Y87 package, which included an Auburn limited-slip differential, better tires, dual exhaust tips, 4-wheel disc brakes, a sportier steering ratio, and more aggressive gear ratio in the differential for automatic equipped cars. Available was a 4-speed automatic transmission or a 5-Speed (V6) or 6-speed (V8) manual transmission. 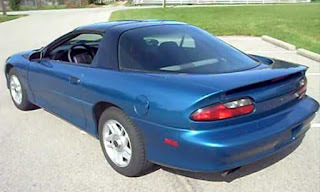 For the 1997 model year, the Camaro featured a new interior and tri-colored taillights that would be standard on all models from 1997 to 2002. It was offered with a "30th Anniversary Edition" that included unique orange stripes on white base paint. It was only available on the Z28 and SS models. A 30th Anniversary Camaro must be white with orange stripes and may be identified by RPO code Z4C on the trim tag. A total of 979 30th Anniversary SS Camaros were made in 1997. 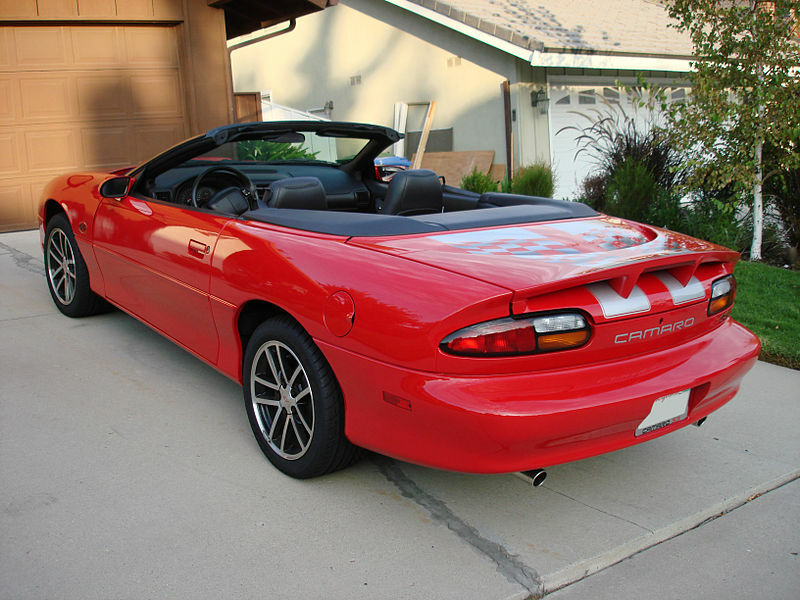 An additional 108 30th Anniversary Camaro SS vehicles were modified by SLP to include a 330 hp (246 kW) version of the LT4 engine (108 total LT4 cars were made, 100 US, 6 Canadian & 2 prototypes). SS cars will have RPO code R7T. The LT4 was the fastest factory-built Camaro available, as well as the most expensive at over US$38,000. New 5-spoke 16-inch wheels became standard on the Z28 this year (17" ZR1 style on SS coupe models) available in either polished, chrome, or white on the 30th Anniversary models, replacing the previous 10-spoke design. 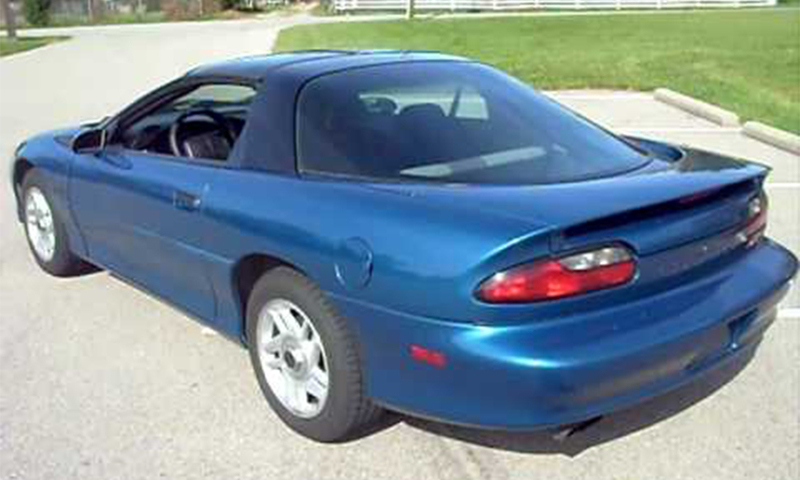 For the 1998 model year, the Camaro was revised and received a new front clip. This replaced the quartet of square inset headlights. 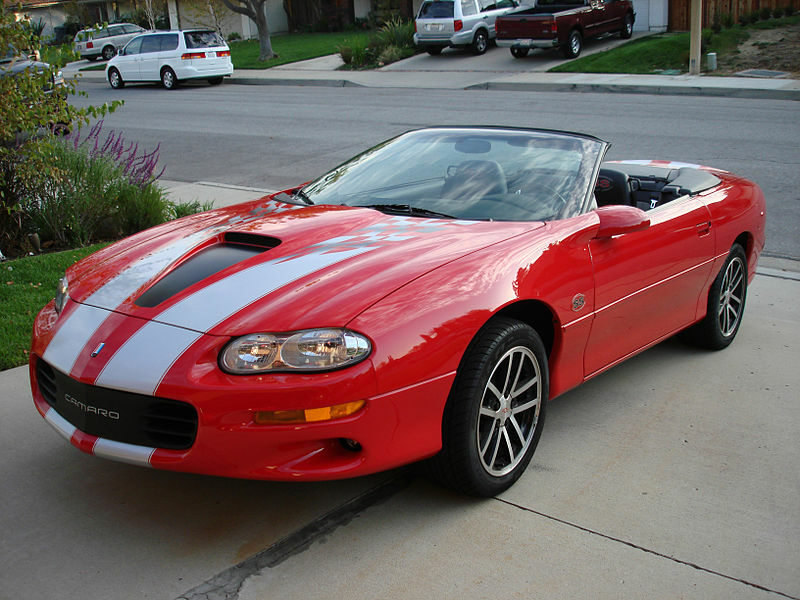 Replacing the LT1 was GM's all-new 5.7 L (346 ci) LS1, which had been introduced with the Corvette C5 in 1997. The all-new design featured an aluminum cylinder block with iron sleeves, reducing weight by about 95 lb (43 kg) with aluminum compared to the iron block LT1. 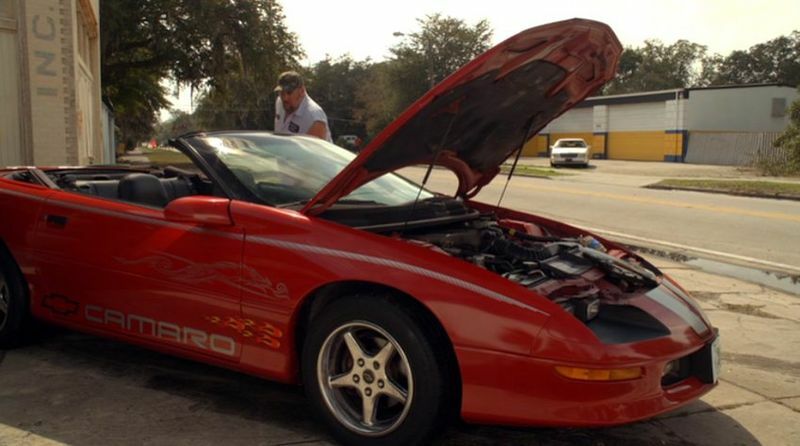 1998 Camaro Z28 from acclaimed movie "Tooth Fairy 2"
Minor changes were made to the suspension and the brakes were increased in size. The LS1 powerplant was rated at 305 horsepower for this year. Total production for 1998 was just 48,495. This is the first year that the SS was actually manufactured by the plant in twenty years. 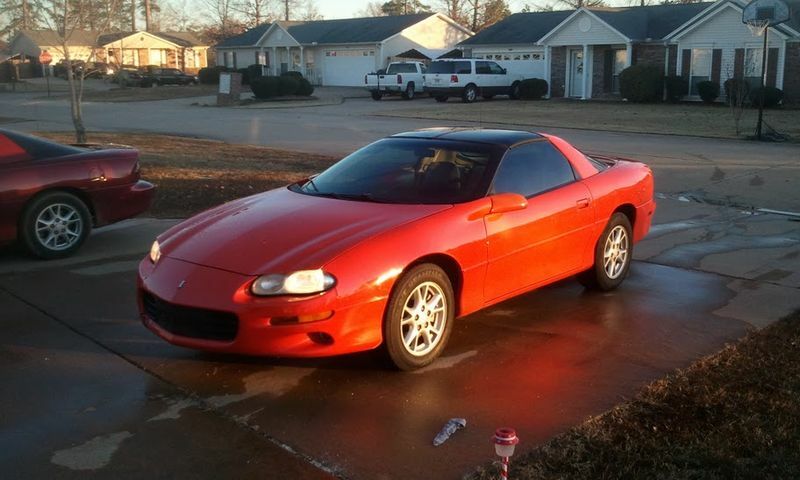 Only a few changes were made to the Camaro for 1999. These included new colors such as "Hugger Orange", fuel tanks were now plastic with 16.8 gallon capacity instead of 15.5 gallon metal units, LS1 valve covers switched to a center-bolt style, and traction control became available on the V6 models. A new "oil change" light was added to the instrument cluster as GM introduced their early oil-life monitoring systems. Coolant temperature gauges were replaced with a dummy gauge. A Torsen differential was added for Z28 and SS models. 1999 was the last model year for the RPO 1LE performance option which included factory installed double adjustable Koni shocks, stiffer springs, a larger front and rear anti-roll bars, and stiffer suspension bushings. Changes for 2000 were also largely cosmetic in nature. Monterey Maroon Metallic was added as an optional color, similar to the previously-available Medium Patriot Red. The SS, however, was not available in this color. GM also changed the name of the previous paint color "black" to "ebony". Previously, all V8 cars had side mirrors painted in this black color. Starting in 2000, side mirrors on all cars were body colored. A new four-spoke steering wheel, as found in other GM models of the time, was introduced to replace the two-spoke steering wheel dating back to the 1993 cars. A new 10-spoke 16 in (41 cm) wheel became available, but the older 5-spokes were still optional. The base models came with 15 inch steel wheels, with hubcaps. The 3.8L (231 ci) V6 and 5.7 L (346 ci) LS1 V8s continued with no changes. 2001 was the lowest production year for the Camaro with 29,009 units. This was partially due to production ending earlier than usual to begin work on the 35th Anniversary cars. The Z28 and SS models received the intake manifold from the LS6, the engine used in the fifth generation Corvette Z06 from 2001-2004. This change also resulted in a revised camshaft profile and removal of the EGR system. GM also introduced a new slave cylinder for the clutch assembly that was superior to the design of previous years, as well as an LS6 clutch in manual models. Accordingly, stated power ratings were increased to 310 hp (231 kW) for the Z28 and 325 hp (242 kW) for the SS which also added a power steering cooler. SLP reintroduced the RS model this year, which included rally stripes and stock cold air intake system and Z28 take-off exhaust (from their SS conversions). The final fourth-generation Camaro was built on 27 August 2002. Total production for 2002 was 42,098. The Boisbriand plant, the only GM plant in Canada outside of Ontario, then closed down. GM's Performance Division unveiled a Z28 show vehicle at the 2002 Woodward Dream Cruise as send off for the Camaro's 35 year heritage. It emulated the 1960s and 1970s Penske-Sunoco stock TransAm race team vehicles. Last updated on 28 September 2015 at 03:09.